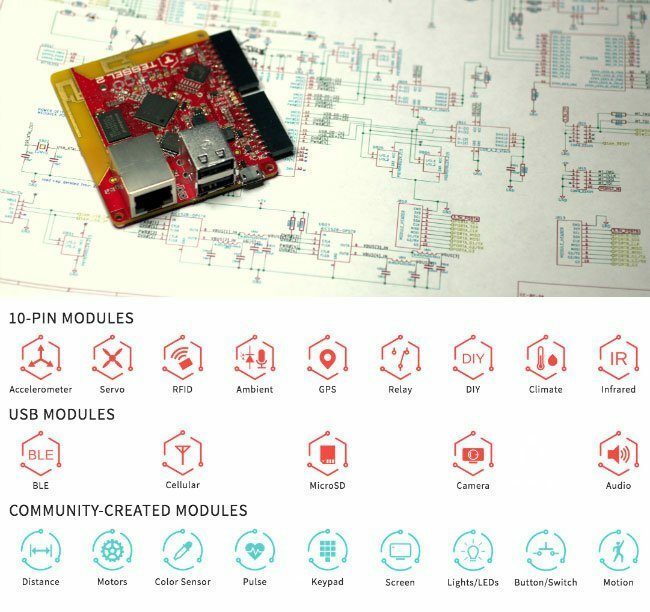 Like the first version, Tessel 2 can be extended by plugging in 10-pin modules to add sensors, cameras, servos, and other connectivity options like Bluetooth or RFID — some produced in-house, others created by the Tessel community. Upgrades in this iteration of the board include better Wi-Fi performance, an ethernet port, and two USB ports that will expand the module options and allow Tessel to be used with other USB devices. Developers can order single boards for prototyping, or order in batches for production. With Tessel 2, Technical Machine is offering customization on orders of hundreds or thousands of boards: A developer can choose to leave out unnecessary components and have add-on modules wired in directly, which will cut costs and simplify manufacturing. Like its predecessor, Tessel 2 is open source. Much of the software has already been published to tessel.io/opensource, and will be joined by hardware designs as the board is finalized for production. At the company blog, Technical Machine noted that while Tessel 2 draws slightly less power than its predecessor, Wi-Fi modules are not well suited to building the truly low-power wireless devices that many Internet of Things developers are interested in. The post hinted that another product announcement is coming next month to meet that need. Tessel 2 was announced yesterday and can be pre-ordered through April 4. Learn more at Tessel.io. Want more free IoT industry info?